Don’t you love it when a friend passes along a favorite recipe? While I enjoy creating new recipes of my own, I am always thrilled to try someone else’s tried and true favorites. 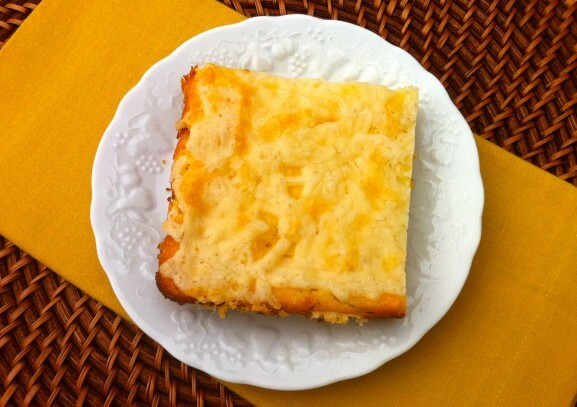 Over the years, one special friend has shared quite a few gems, including this recipe for corn spoon bread. Her Thanksgiving table would be incomplete without it. Since she first shared her recipe many years ago, I have served this baked corn-cornbread hybrid year round and it is a consistent crowd pleaser. Last year, I paired this with my Chicken Tortilla Soup recipe and gave a ready-made meal to several friends. Both are easy to make ahead, freeze and reheat well, and brought smiles to faces when I made the deliveries. What’s more, I felt good giving a gift that was truly from the heart and that I knew would be appreciated during the fun yet often hectic holiday season. This recipe can be made in one 9×13-inch baking dish or two 9-inch pie plates. 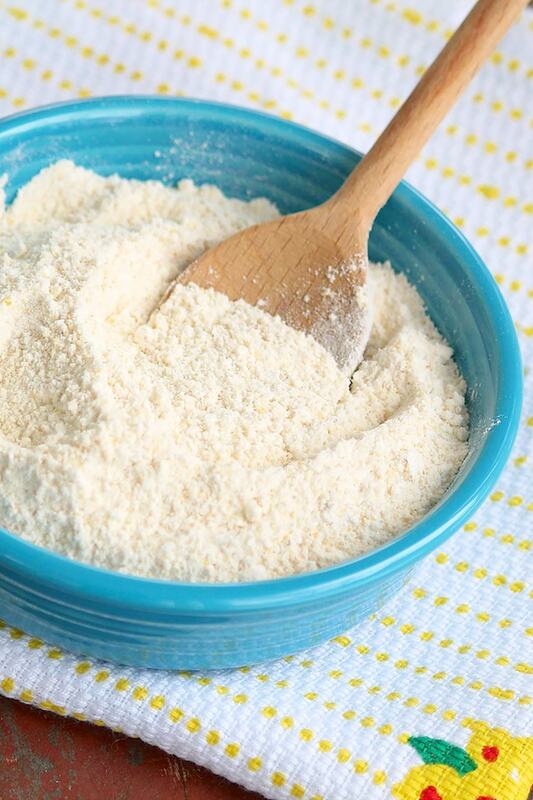 For a homemade option to the Jiffy mix (which can be made gluten-free), follow this link. This dish can be prepped ahead and cooked when ready to eat. It can also be baked ahead and reheated. Freezes well, too! Combine all ingredients except the cheese. Spread into greased 9×13 baking dish, and bake for 30 minutes. Remove from oven, sprinkle cheese on top, and bake for 10 minutes more or until cheese is melted and top is golden. Sometimes, I bake this recipe in two pie plates or 8-inch square pans and freeze one for later use. In that case, I bake for 25 minutes before topping with the cheese, then bake 10 more minutes to melt the cheese and slightly brown the top. Additionally, I have tried this recipe using all Greek yogurt in place of the sour cream. Hot out of the oven, a hint of tartness was present. When reheated the following day, the tartness had mellowed and the difference between the two versions was hard to detect. We love this and there’s so much you can do with it too! We add diced jalapenos or other peppers and/or crumbled cooked sausage. Your additions sound terrific, Jane. I might have to branch out and use jalapeños the next time. They would pair well with the cheddar! I have to try this one also and so very easy! My mom was from Tennessee and we grew up eating corn bread of various types. I might try it in a big cast iron skillet I have. Thanks for the tip on Greek yogurt too, think that is what I will use. YUM! I love spoon bread but didn’t know how to make it. Thanks for sharing your recipe on Thursdays Treasures. You are welcome, Christie. It is always a pleasure! I have made this for years, but never used the eggs or cheese. It is delicious either way. I’d love to try it your way, too, Sharon! I have made this recipe for years but my directions call for you to mix 3/4’s of the cheese into the main mix and then sprinkling the remainder on top after it has baked for awhile. I am wondering what the difference is in the texture when prepared your way?? The difference is probably not too significant, Donna. With one cup of cheese in all, I think you might actually taste it more when it isn’t mixed in and you get a concentrated amount on top of each bite. But I bet it’s delicious both ways! 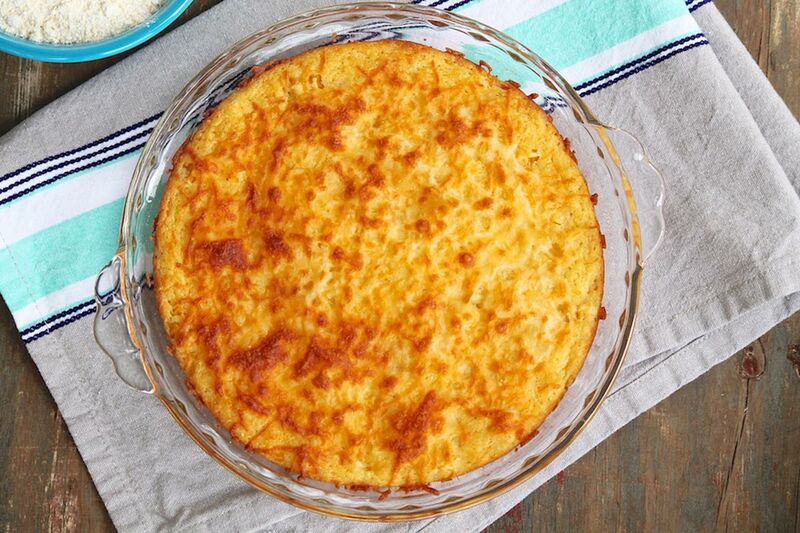 I’ve made your corn spoon bread recipe many times and enjoyed it. The last time I made it, I froze a tray for later. I took a chance and baked it from frozen at 350 for maybe an hour, and it was delicious. In future I’ll thaw first just to cut the amount of time using the oven. Thank you!! Great feedback, Gina…thank you for sharing it, and I’m so glad this recipe has been a keeper! You can absolutely omit it, June. I made this on Thursday night and it is really good!